7 p.m. Tuesday - Reid and Democratic candidates will attend an Election Night event hosted by the Nevada State Democratic Party at the Bristlecone Ballroom in the Aria Resort & Casino at CityCenter, 3730 Las Vegas Blvd., Las Vegas. 7 p.m. Tuesday - Angle is expected to join Republicans at election campaign watch party at the Venetian Las Vegas Hotel-Resort-Casino, 3355 South Las Vegas Boulevard Las Vegas. "This election is not about all that we have accomplished these past several years. This election is about all we have left to do.... Harry Reid is a champion for folks who need someone on their side again. We're here to renew that promise and support that dream." "When he went in as Senate Majority Leader we were at 4.4 percent unemployment. And now ... we're at 14.4 percent unemployment, but when you put in the under employed and those who have quit looking for jobs, we're really at 22.3 percent unemployment. And we lay those squarely at Harry Reid's doorstep." "We chose the Aria Hotel specifically because it’s where Harry Reid’s campaign will be. We decided to go straight into the belly of the beast, just like we did when we kicked off the last tour in Searchlight, a mile or so from Harry Reid’s house." "We're very pleased they've chosen to spend their money at a project Sen. Reid saved." 9:30 a.m. today - Reid will host First Lady Michelle Obama for a Get Out The Vote rally at Canyon Spring High School, 350 East Alexander Road, North Las Vegas. Tickets are suggested but not required. They can be obtained by calling (702) 699-7343 or going to www.HarryReid.com/countdown. Doors open for the public at 8:30 a.m. Angle's staff has not been disclosing any public appearances ahead of time to the media. "The idea of losing Senator Reid for those people that are opposed to Yucca Mountain being the national repository is devastating. We’ve been fighting this for so long and people have become so accustomed to it that I don’t think they realize how important Senator Reid has been to stopping it." "I've always voted against making Nevada the nuclear waste dump of the nation. ... We need to quit demonizing the nuclear energy industry." John McCain thinking Yucca Mountain in Las Vegas visit? 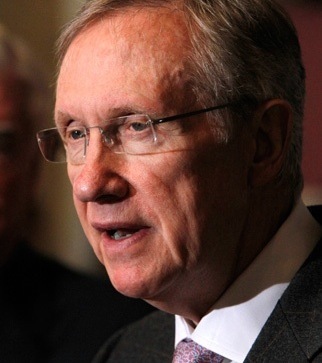 Washington Post: The Plum Line: Did Harry Reid succeed? 9 a.m. today - Reid will make a campaign stop at his headquarters in Sparks, at 1380 Greg Street, to serve breakfast to volunteers prior to their going out to canvass. 9:30 a.m. Monday - Reid will host First Lady Michelle Obama for a Get Out The Vote rally at Canyon Spring High School, 350 East Alexander Road, North Las Vegas. Tickets are suggested but not required. They can be obtained by calling (702) 699-7343 or going to www.HarryReid.com/countdown. Doors open for the public at 8:30 a.m.
"I've never seen the economy the way it is either. It's a very difficult time for people. For 20 years we were at the top of the economic food chain," he said of Nevada. "But I didn't create the economic problems. If that's the case, I should get credit for the 26 years it was good." "We were just coming down the escalator, and there were three cameras and two reporters and it kind of caused a scene. You know, airport security is pretty tight. It's not a really good place to have an interview." 9:15 a.m. today - Reid will observe parade floats and meet voters at Long Street, Float #25, Division 4, in Carson City. 3:30 p.m. today - Reid will attend a Volunteer Canvass Kick Off at his Reno Campaign Headquarters, 1380 Gregg Street, Sparks. "Manny Pacquiao and Harry Reid came from different sides of the globe, but we came from the same side of the street,” Reid said. “It’s not enough to fight for yourself...It’s not enough to want to be a champion. We want to be champions for others." "Obama deluded our young people with lies. Our young people support an idea that doesn’t exist. We, as mature and intelligent adults, know what freedom and prosperity means.... Obama is not a Democrat; he is a radical socialist more sympathetic to our enemies than our allies." 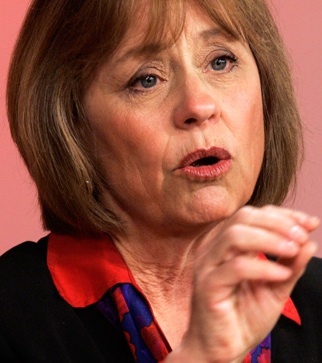 Washington Post: Harry Reid: Sharron Angle is "pathological"
10 a.m. today - Reid and Nevada Assemblyman Ruben Rihuen will kick off a volunteer canvass to encourage Nevada voters to participate in the last day of early voting at Reid's Mojave Campaign Office, 3100 E. Charleston Blvd., Suite 104, Las Vegas. 6 p.m. today - Reid will attend a Get Out the Early Vote rally with seven-term world champion boxer Manny Pacquiao and Nevadans and their families at Orr Middle School, 1562 E. Katie Avenue, Las Vegas. After the rally, attendees will be encouraged to vote at nearby Boulevard Mall. 9:30 a.m. Monday - Reid will host First Lady Michelle Obama for a Get Out The Vote rally at Canyon Spring High School, 350 East Alexander Road, North Las Vegas. Tickets are suggested but not required. They can be obtained by calling (702) 699-7343 or going to www.HarryReid.com. 6:30 p.m. to 10 p.m. tonight Angle's staff has not been disclosing any public appearances ahead of time to the media. However, there have been media reports that U.S. Sen. John McCain, R-Ariz., will campaign for her tonight at a get-out-the-vote rally in the Mardis Gras Ballroom at the Orleans Hotel & Casino in Las Vegas, which will also feature actor Jon Voight. For tickets: 702-243-1976, ext. 202. "... it would be disastrous for the state of Nevada, and the wellbeing of rural Nevada, to lose the steady, experienced hand of our senior United States Senator. While I don’t agree with everything he does and says, Sen. Reid has shown that he understands the challenges Nevadans face and he is willing to do anything to help the people he serves. A good example of that can be seen in the approximately $4 million he brought to Yerington for water and energy projects. I can’t say the same for Sharron Angle. She scares a lot of people, and her pledge to kill Social Security and not create jobs have removed any confidence people may have in her ability to carry out the duties of a U.S. Senator." "Your Lifespan will depend on what you do on November 2, 2010. Harry Reid voted for and pushed through the $1.1 trillion government-run healthcare takeover that has 'Benefits Panels' for our seniors. These panels will decide if you get needed medical treatment, in part based on age, even if yur doctor says it is medically necessary in order to save your life. If the panel decides no . . . that means your life will not be saved ... "
Democrats have money; will voter enthusiasm follow? 1:15 p.m. today - Reid will host a phone bank alerting seniors to Sharron Angle calling Social Security "wicked," as reported in Politico. The event will be at Reid's Summerlin Campaign HQ, 810 S. Durango, Suite 109, Las Vegas. 3 p.m. today - Reid won't be there, but a group of seniors will gather outside Sharron Angle’s campaign office in Reno, at 1280 E. Plumb Lane, Suite C, to "protest her extreme position on Social Security and her recent dangerous comments denouncing Social Security as 'wicked' as reported in Politico." Angle's staff has not been disclosing any public appearances ahead of time to the media. However, recent posts on her Twitter account said on Wednesday she was in northern Nevada: at Battle Mountain, at the International Cafe in Austin, the Owl Club in Eureka and in Elko at her campaign headquarters and at a senior center. "My goal is turnout all voters but I think we have an especially difficult situation which she has created ... All she does is cause people to be afraid. There is no reason to be afraid -- we've got to work our way through this issue. She has not issued one positive statement ... constructive statement about what we do with the issue of immigration. It's something we have to fix. "We can’t do it with people like her demagoguing the issue. And to think -- to think -- that someone would suggest in America that people should not vote." "She has been part of an effort to have people not vote ... That's about as un-American as you can get." "Well, I think it’s very dangerous for us to be very stereotypical. We have a border problem. It’s not only Southern; it’s Northern and coastal. And we need to be very careful about stereotyping because when we do that we come to wrong conclusions sometimes." 9:15 a.m. today - Reid and actor Kal Penn will host a Get Out the Early Vote breakfast meet & greet at Bibo Coffee Co, 680 Mount Rose St., Reno. 11 a.m. today - Reid and actor Kal Penn will host a UNR Early Vote Ralley at the University of Nevada, Reno's Joe Crowley Student Union, Front Patio, 1664 N. Virginia St., Reno. 3:45 p.m. today - Reid, actor Kal Penn and U.S. Commerce Secretary Gary Locke will host a Volunteer Canvass Kick Off at Henderson Campaign Headquarters, 2925 N. Green Valley Parkway, Suite C, Henderson. Angle's staff has not disclosed any upcoming appearances. "It’s hard to buy an election with a hamburger." "I am sorry to report that the Democrats and their cronies are up to their same old tricks, of trying to manipulate the election in hopes of skewing the results in their favor. Two days ago, the Democratic Secretary of State announced that voters can be provided 'free food' at 'voter turnout events.' Harry Reid has been offering free food and, according to other reports, some Democratic allies such as teachers' unions are offering gift cards in return for a vote for Reid." Christian Science Monitor: Sharron Angle ad: Is it racist? 7:45 p.m. today - Reid will be joined by Sen. Al Franken, D-Minn., and AFL-CIO President Richard Trumka, at a Get Out the Early Vote rally at the Washoe County Senior Center, 1155 E. Ninth Street, Reno. 7 p.m. today - Angle's staff has not disclosed any upcoming appearances. Democrats tracking her, including one in a chicken costume, think she will be at a Hispanic community meeting at Auguilas Centro Familiar Cristiano, 6744 Spencer St., Las Vegas. "Sen. Reid is like a tiger. He’s going to fight for us, and he’s going to win with all the Asian votes." "It was a private meeting with Microsoft, which we were running late for, then we had to hit the road for a meet and greet in Lake Tahoe, which we were also late for." Politico: Tea party candidates losing steam? Computerworld: With cell phones excluded from surveys, are polls skewed? 10:30 a.m. to 11:30 a.m. today - Angle's staff has not disclosed any upcoming appearances. Democrats tracking her think she will make a workplace appearance at Microsoft Licensing GP, 6100 Neil Road, Suite 100, Reno. "“I don’t work for the president. I don’t carry his water or anybody in the administration’s water." "I think she should have a press conference at least as often as President Obama...check how often President Obama has had real press conferences, very very seldom, less than any recent President." 2 p.m. to 5 p.m. today - Reid and civil rights leader and state Rep. John Lewis will lead a canvass with grassroots volunteers through the Lorenzi Park neighborhood in Las Vegas. The Nevada State Democratic Party and the Clark County Democratic Black Caucus will host the "Get Out to Vote Canvass BBQ and Canvass Kickoff," which will be near the gazebo at Lorenzi Park, 3333 W. Washington Blvd., Las Vegas. 6 p.m. to 8:30 p.m. today - Angle's staff has not disclosed any upcoming appearances. However, Democrats tracking her think she might make an appearance at the Republican Jewish Coalition rally at The Venetian Las Vegas, 3355 Las Vegas Blvd. South, Las Vegas. Registration is at 6:30 p.m. and the program is from 7 to 8:30 p.m.
"We need Harry Reid at the table. He’s our only leverage. If we elect Sharron Angle, it would probably be the most embarrassing moment in Nevada’s history." “We’re getting over 90 percent of the Republican vote, so they might be one of the most ineffective coalitions in campaign history." I've secured $8 million to build a park in the Mt's Edge Community. 90 new jobs will be created to build trails, picnic areas & open spaces. Can Sharron Angle make yet another late surge? Which school visit will prove more important? Miami Herald: Do all these expensive campaign ads matter? "You know, Harry’s not the flashiest guy, let’s face it. (Laughter.) You know, Harry kind of speaks in a very soft voice. He doesn’t move real quick. (Laughter.) He doesn’t get up and make big stem-winding speeches. But Harry Reid does the right thing. (Applause.) Harry Reid has never forgotten what it’s like to grow up Searchlight, Nevada. Got a Searchlight folk right here. (Applause.) He knows what it’s like to be poor. He knows what it’s like to work hard. He knows what it’s like sometimes to hit some bumps in the road, to hit some obstacles, to have to overcome some stuff; that things don’t always work out perfectly.But because of that, because he remembers where he came from, it means that he thinks every single day about how am I going to give the folks in Nevada a better shot at life." “Unfortunately, you arrived in Las Vegas on the day it was announced that the city has 15 percent unemployment. The only person you have helped in Nevada is Sharron Angle in her campaign for Senate." 4:30 p.m. today, Oct. 22 - President Barack Obama will campaign for Reid at a Moving America Forward rally, which will be at William E. Orr Middle School Park, 1562 E Katie Ave., Las Vegas. 5:30 p.m. today - Angle's staff has not disclosed any upcoming appearances. However, Democrats tracking her appearances think she will be at the Washoe Republican Women Fall Dinner Meeting, which begins at 5:30 p.m. today at the Atlantis Casino Resort Spa, 3800 S. Virginia St., Reno. "People in Nevada know me. From the street to the ring to the Senate chambers, I've never had to prove my manhood to anyone." “He needs to take some responsibility. He says it is not his fault on the economy. Man up, Harry Reid. He says there is no problem with Social Security. Man up, Harry Reid. He says this war is lost and your general is dishonest. You owe us an apology. Man up, Harry Reid." 8:30 a.m. Oct. 21 - Reid will urge customers at Gritz Café, 1911 Stella Lake Street, Las Vegas, to vote early and will hand out 100 tickets for his campaign rally featuring President Obama. Reid will be joined by Clark County Commissioner Lawrence Weekly and Las Vegas Ward 5 Councilman Ricki Barlow. 7 p.m. Oct. 21 - Angle's staff has not disclosed any upcoming appearances, but former GOP House Speaker Newt Gingrich will bring his "Jobs Here, Jobs Now Tour" to support her campaign at JW Marriott Las Vegas, Marquis Ballroom, 221 N Rampart Blvd., Las Vegas. Tickets: AmericanSolutions.com/LasVegas. "Listen to her latest: Running ads on Hispanic television, telling people not to vote. She's trying to keep people from voting." – Reid at a rally Oct. 19 in Las Vegas, as quoted in a story by Vermont Public Radio. "Now on the national news yesterday… Christine O'Donnell said there is no separation of church and state. Now I don't know why that made such a big headline yesterday because Sharron Angle said something worse two months ago. She said … there's no such thing in the constitution as the separation of church and state. Try the First Amendment. If my opponent wants to run as a Constitutional expert, she should at least know what's in it or maybe she hasn't read it. ... Nevada simply can't afford this embarrassment." "Every time, and it's quite often, my opponent talks herself into a corner she goes back into this bunker. We don't know where it's located." “What we know is that our northern border is where the terrorists came through. That’s the most porous border that we have. We cannot allow terrorists; we cannot allow anyone to come across our border if we don’t know why they’re coming." "No ad should ever discourage voters from voting or expressing their opinions at the ballot box." – Angle's spokesman Jarrod Agen said in a statement to ABC News, denouncing a controversial ad urging Hispanic voters in Nevada not to vote as a way to send a message to Democrats (ABC News). "Every state needs at least one sheriff like Joe Arpaio." MSNBC: Reid: Angle an 'embarrassment;' Biden on why Tea Party's bad for U.S.